Mick Mulvaney, acting director of the Consumer Financial Protection Bureau (CFPB), speaks at a Senate Banking, Housing & Urban Affairs Committee hearing. Photo credit: Toya Sarno Jordan/Bloomberg. There is a great deal of inertia in government, and opportunities to reform existing institutions only come around every so often – remarkably the stars have aligned, and we have hopefully arrived at just such a moment for the Bureau of Consumer Financial Protection (the bureau). Americans’ sentiment is in agreement with a policy of change at the bureau as well. When polled, an overwhelming majority (66%) preferred the current approach of writing rules rather than the previous administration’s rulemaking by enforcement. So what’s left to do? It’s time to make these changes happen, working with lawmakers and the bureau to sort out the details. Yesterday, I highlighted concrete actions the bureau can take to do just that. Testifying before the House Financial Services Subcommittee on Financial Institutions and Consumer Credit, I discussed a number of ideas including reforming the bureau’s approach to external engagement with industry stakeholders and addressing concerns about its complaint database – two issues for which CCMC has recently submitted comments to the bureau. I do not think placing the Bureau under appropriations would harm consumer protections. The rules are on the books, and Mr. Mulvaney has made it clear he’s a steward of the law, he will execute the rules fairly and accurately. Having oversight over the Bureau would, in the long term, be a benefit for everyone. With new leadership there is the opportunity to make the Bureau a more mature, transparent, and accountable agency… Only with this approach will the Bureau adequately serve and protect consumers, while still promoting a competitive and transparent marketplace that fosters access to credit to all consumers. Government, industry, and consumers alike have the appetite to make improvements to the bureau, and the U.S. Chamber is committed to working with Congress and the bureau to get the reform agenda right. 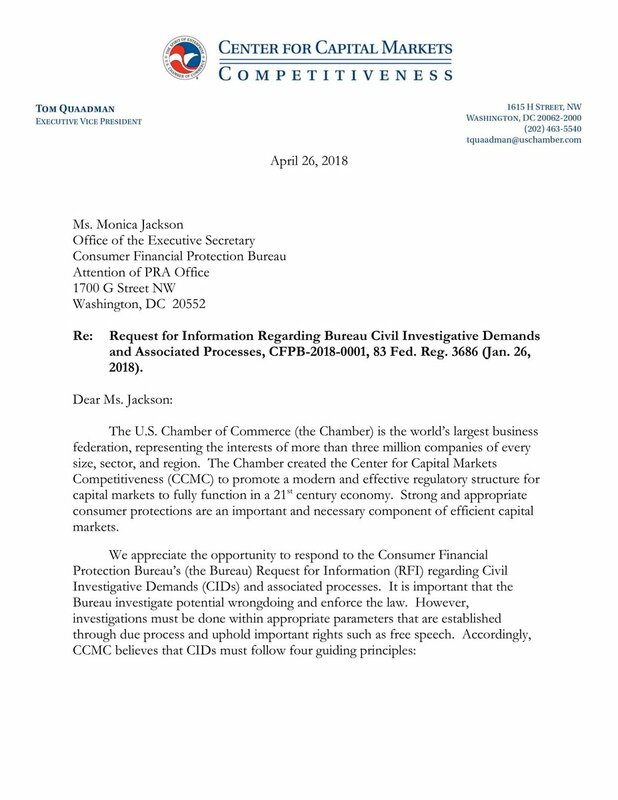 This summer, we have the opportunity to contribute to the bureau’s audit on behalf of U.S. Chamber members, and we won’t miss a single chance. We encourage you to check back to read our comments throughout the summer here.